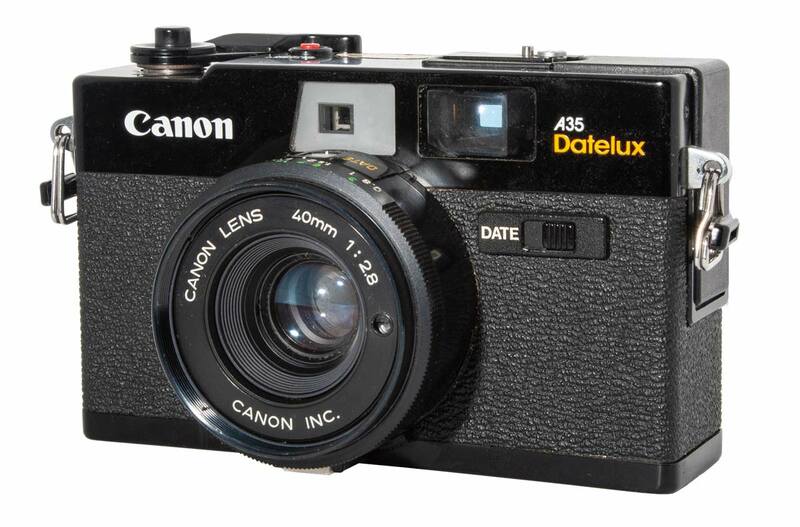 The A35 Datelux and A35 F are sometimes referred to as the last of the Canonets although the Canon Museum lists them under “Film Cameras/Other”. 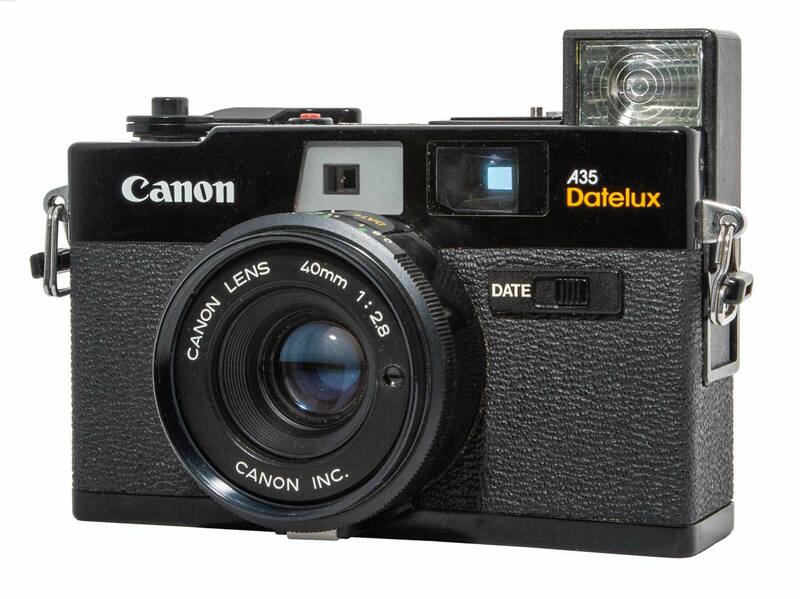 With the A35 we come to the end of the Canonet line. 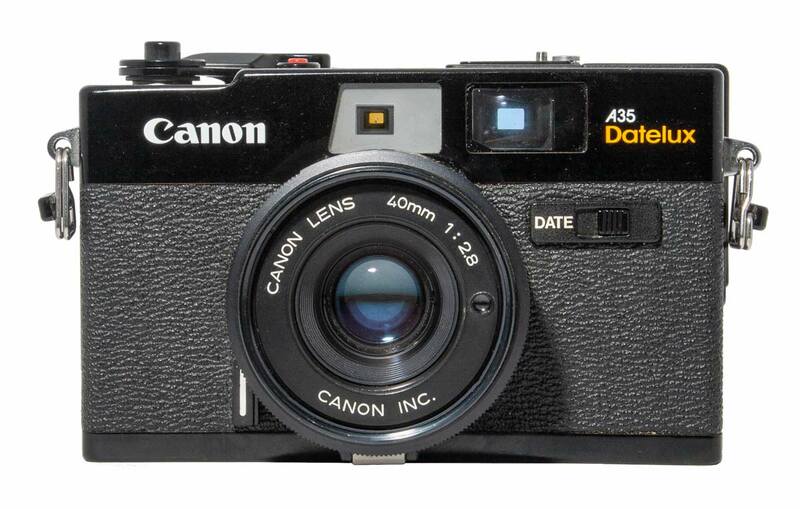 In fact, the Canon museum does not include these cameras in the Canonet lineup but the A35’s are clearly based on the Canonet 28. Putting the A35 F side by side with the Canonet 28 the common ancestry is obvious. The greatest difference lies in the finish: the Canonet is in the traditional chrome finish with black faux leather panels while the A35 F is in a sleek shiny black finish. But they are similar in function, size and layout. The A35 Datelux came first being introduced to the market in October of 1977. 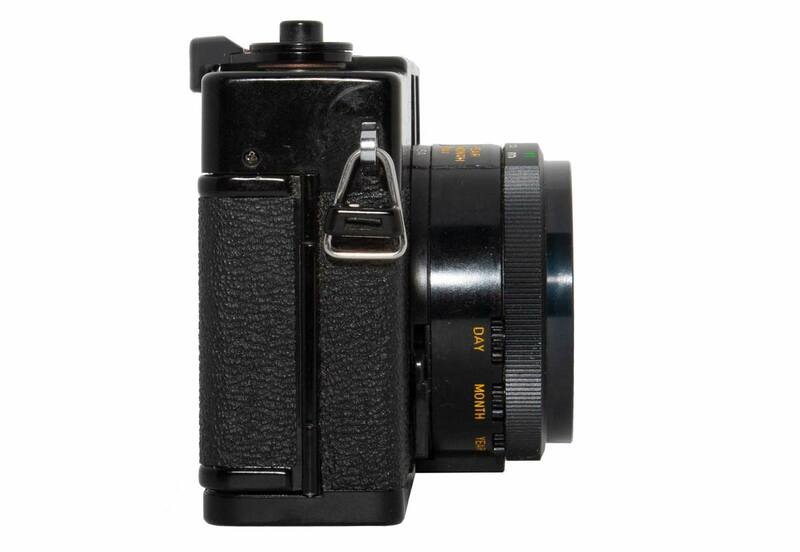 It was a rangefinder camera with a 40mm f/2.8 lens. Exposure was fully automatic (manual control was not possible). 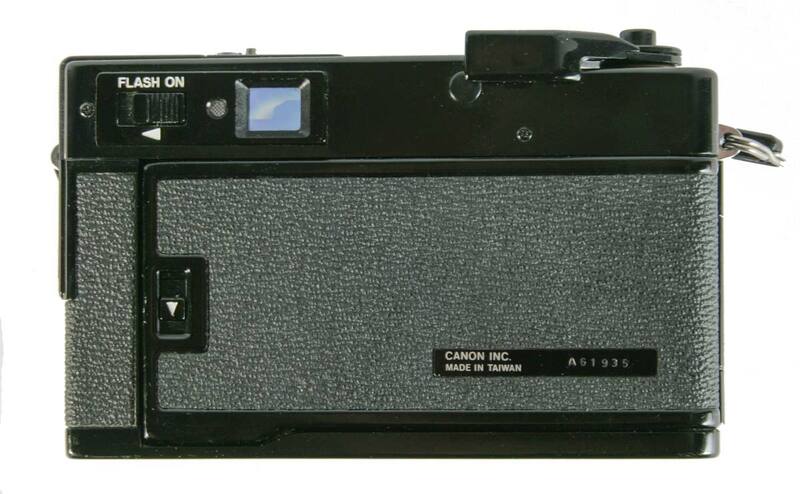 But to that point it was simply a Canonet. But this camera went further. 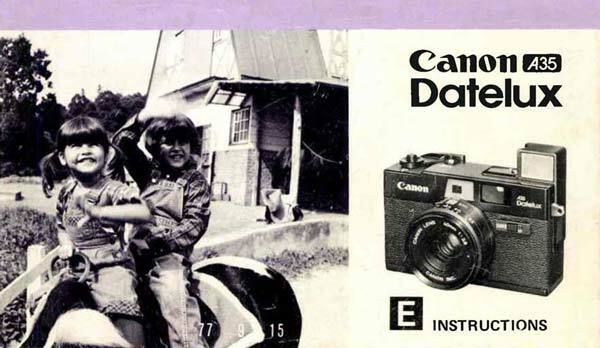 The Datelux was Canon’s first camera with a built in flash. Thus we see no hot shoe. It was deemed unnecessary. The flash was normally retracted and unseen and when needed it would pop up from the top of the camera by the press of a switch on the back of the camera. The Datelux with the flash extended. The “Date” switch on the front allows the user to engage the date imprinting function or turning it off. The CdS sensor is visible on the center right of the lens barrel. The Datelux from the front with the flash retracted. The self timer is engaged with the lever to the left of the lens barrel. 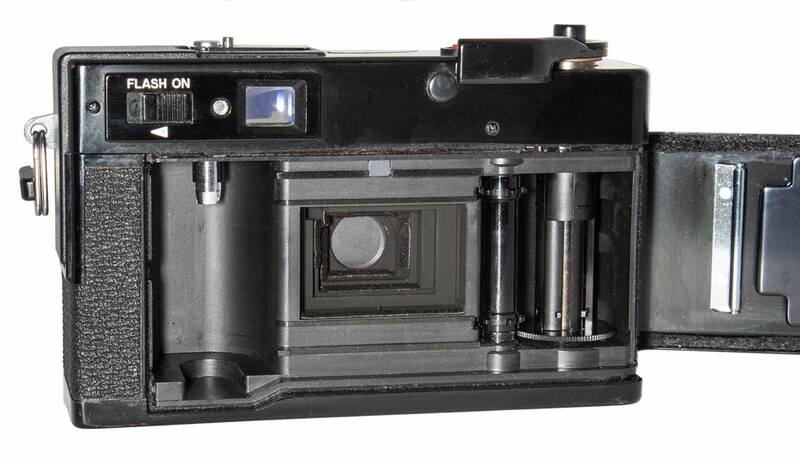 The flash was coupled into the auto exposure system by Canon’s CAT system, the “Canon Auto Tuning” system. 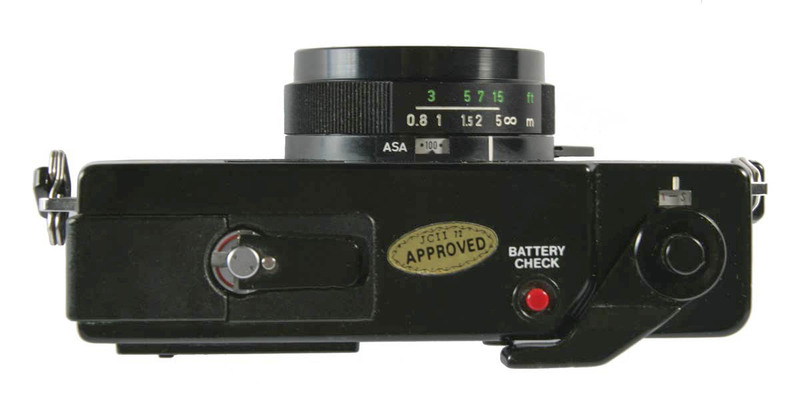 The flash exposure was set based on the distance to the subject, read from the rangefinder distance, the film speed and the guide number of the flash. The flash is powered by a single AA cell. 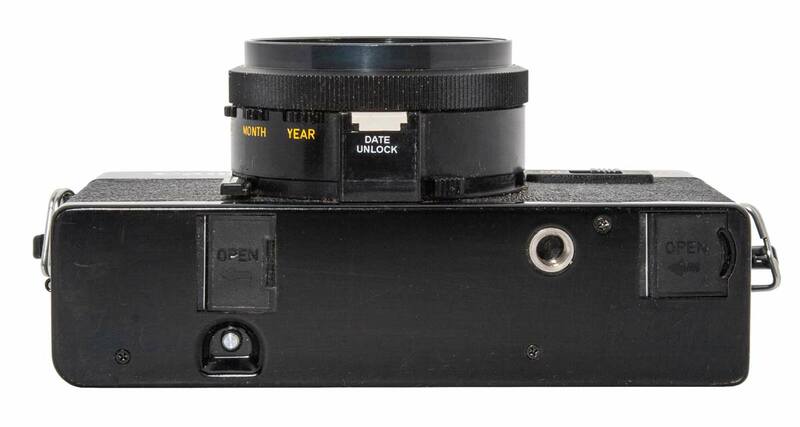 Possibly even more interesting is this camera’s ability to imprint the date on the lower right corner of the image. When the shutter is pressed half way the film advances and the date is displayed in to bottom center of the viewfinder. When the shutter fires the date is imprinted on the negative. This feature is somewhat crippled today by the fact that the years that can be set are 1 to 9 and 78 thru 88. So in 2018 we are, sort of, out of luck. The lens is 5 elements in four groups and the iris is a crude affair with a roughly diamond shape. But it works. 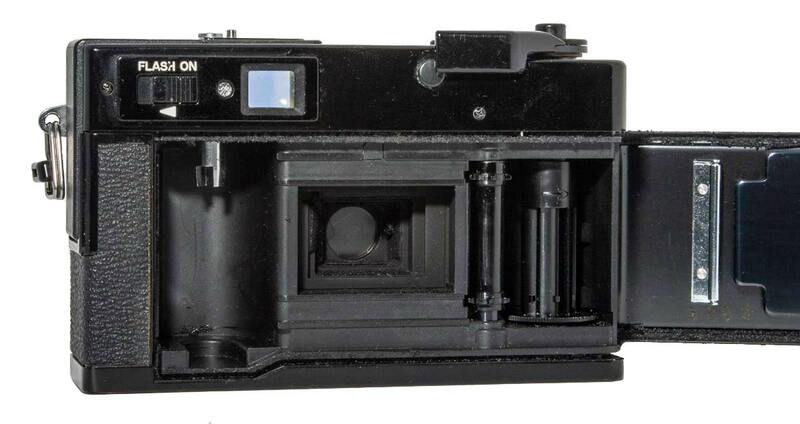 The shutter can operate between 1/60th and 1/320th. Exposure is determined using a built in CdS cell mounted on the front of the lens barrel. ISO (well, in those days it was ASA) is set between 25 and 400. Power to the CdS cell is provided by two 1.35 v mercury cells (actually it was but that ‘s not legal any more!). One more thing to note: there is no on-off switch so the CdS cell is discharging the batteries at all times. This is reduced when the lens is covered but not totally. So if the camera is not to be used for a while, the batteries should be removed. 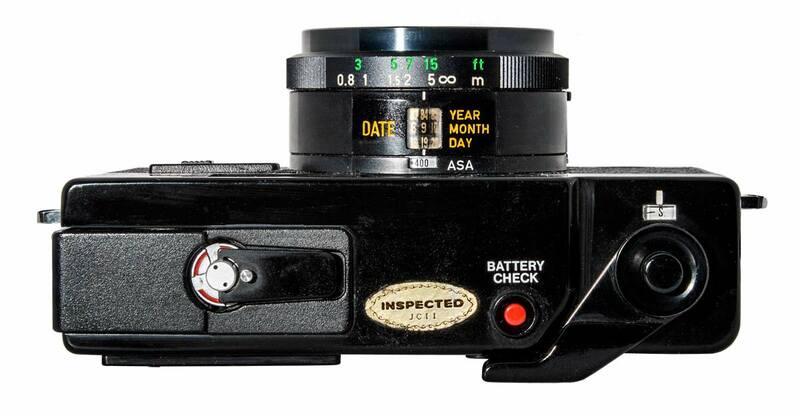 The top of the Datelux is uncluttered: a rewind crank, Battery Test Button, film advance lever and shutter button. On the bottom are two battery doors; one for the two mercury cells and the other for the AA battery for the Flash. From the side the serrated wheels that allow you to set the day, month and year are visible on the lens barrel. 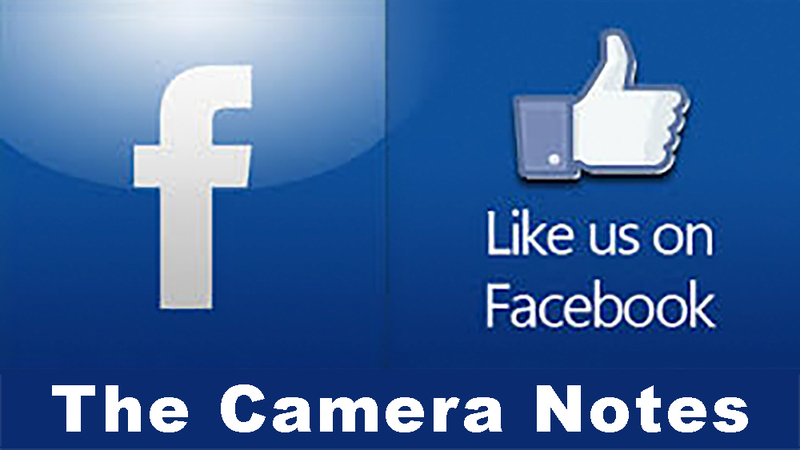 The camera, inside, is a straightforward manual design with no quick load features. 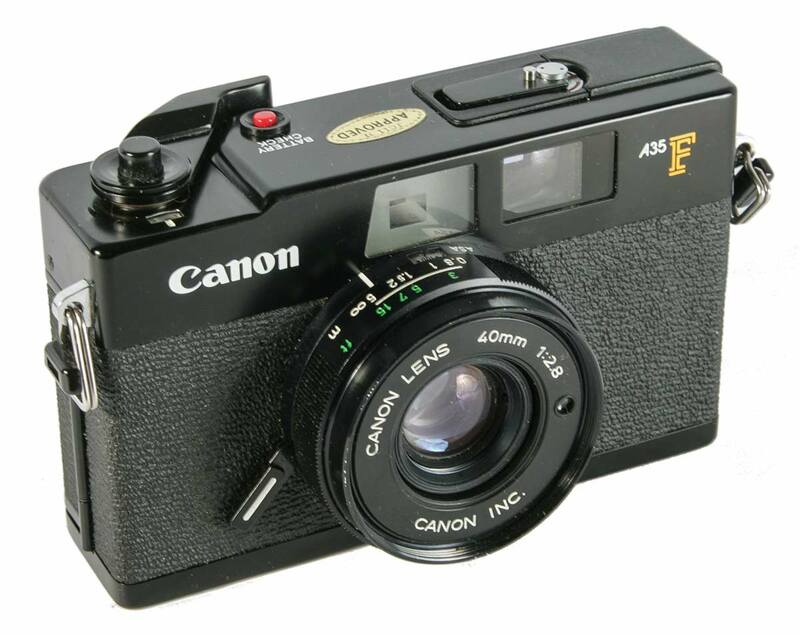 In March of 1978 Canon released the A35 F for export only. It was not released in the home market. The A35 F was the A35 Datelux in every respect, except one: it lacked the date imprinting function. Otherwise, it was identical. More than that there is not much to say. 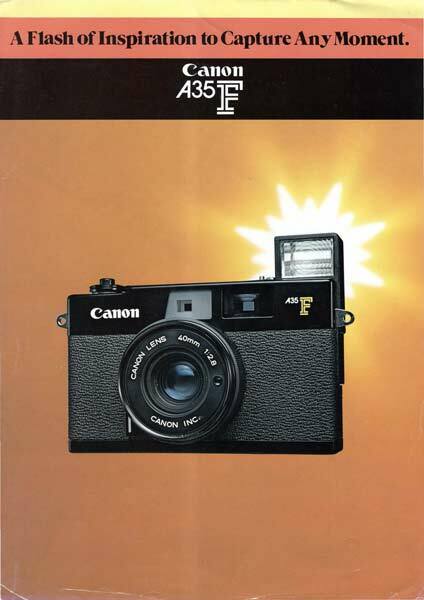 The details above apply to the A35 F.
A promotional brochure for the A35 F.
The User Manual for the A35 F.
Function: Camera appears to function correctly but it has not been tested with film yet. 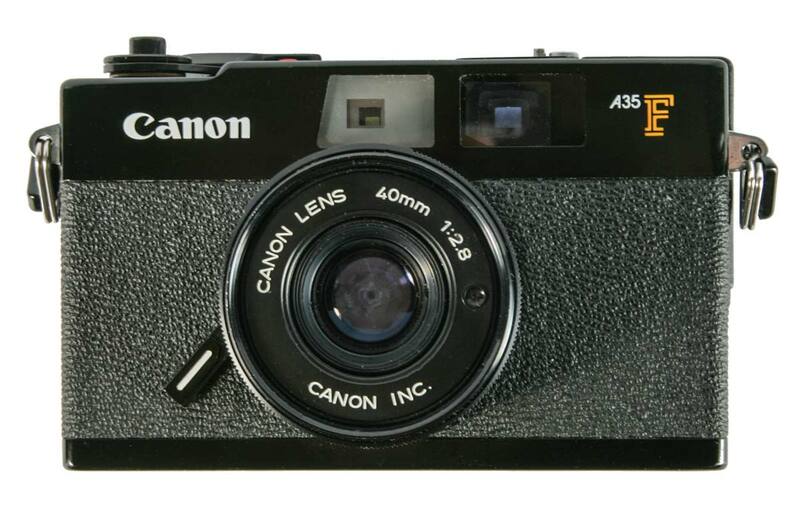 And with the A35 F the Canonet line came to an end. Unfortunately for this last camera it came out a year before the Canon Sure Shot which overshadowed it completely. 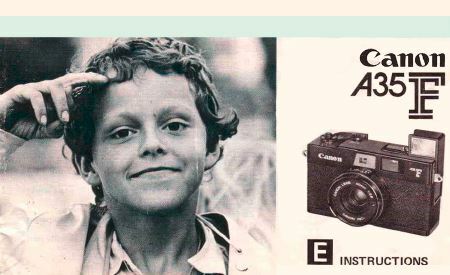 The era of auto focus had arrived and with it many fine cameras were eclipsed.